This one comes from Miami. Bask in the Florida ridiculousness. I know, I know... you’ve already looked at the pictures and were like DAAAAAAANNNNNGGGG! It’s ok.... I get that a lot. And soon, with the right amount of cash, you will too! What you are now drooling over is a near perfectly preserved 2000 Dusky 233 FAC. Just let that soak in for a moment. Let it marinade... Yes, it’s true. I have one. And it’s cherry. And lucky for you, it’s for sale, right here on THIS planet! What does this mean to you? It means that for 24 grand (or 96,000 quarters ) you could be the next Captain of the “Love Ship.’ With a Four Stroke DF225 Suzuki engine propelling you across the water like a greased up porpoise made out of pure testosterone, the ladies will flock to you like you cry diamonds and chocolate. This boat has so much style, Kim Kardashian would wear it, if only her backside would fit in it. It has so many amenities and technical doo-dads, fighter pilots are all like “HUH? ?” You take a ride like this out on Boca Lake this Summer, and Boca Raton City Hall is likely to pass legislation making bikini tops illegal within 100 feet of you. I’m not kidding folks, this boat is like the exact opposite of a restraining order. In fact, this boat is such a booty magnet, I won’t even sell it to a married guy. It’s THAT powerful, and I don’t want that kind of karma bothering me at night. The details... This boat was made right here in good ol’ South Florida, painstakingly handcrafted by people who know how to painstakingly handcraft this kind of stuff. It’s a 2000 model, which I purchased 3rd hand as part of a NASA experiment to study just how far away pure awesome could still be measured. And you thought the Mars rover was so we could check out Mars..? Pfffft. What comes with it? A Fusion Head Unit that uses Bluetooth to stream music. Freaking Amazing! For you Baby Boomers, Bluetooth is a button on your phone that you think is really complicated but it’s not! I’m willing to give you 3 FREE, 1 hour Bluetooth training sessions if you buy this outstanding vessel. It also comes with a T-TOP, rope, and a bunch of rafts, so you can haul extra poonanny-stank around on those really big weekends. Speaking of poonanny-stank, did you see the stabbin’ cabin?? The v-berth is over 6' long and you can stand in the galley, this is the largest cabin to ever go in a 23' boat (documented and proven true). Last weekend I was rafted up next to a 65' Viking and the overzealous owner was drooling over this cabin. Depending on the type of chics you like, you could fit between 2 and 15 fine females in here. Fishing? Pff.. More like catching. 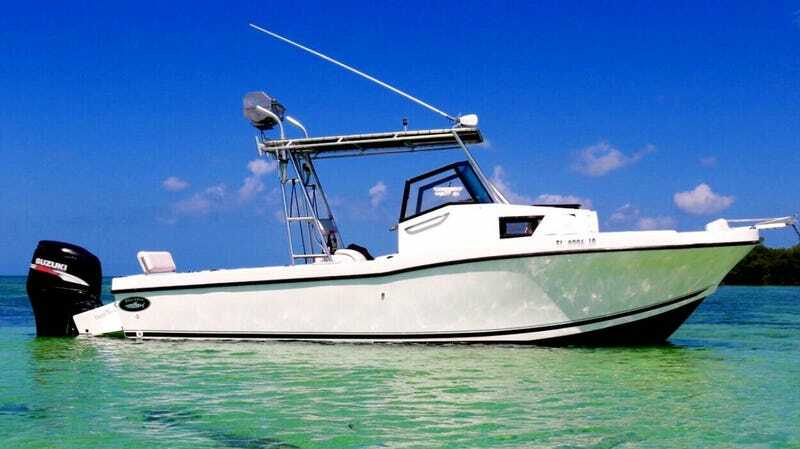 Tuna, Mahi, Sailfish, and grouper flock to this boat like the Salmon of the Capistrano. I have an entire warehouse full of fresh frozen fish, enough for a lifetime. . . So I’m willing to let someone else reap the benefits of this fish slayer. In the rare occasion that fish aren’t just flying into the cockpit of the boat, this bad boy is equipped with not one, but TWO live wells. Also, equipped with two state-of-the-art swivel outrigger bases and extending, telescoping outriggers. Biggest problem is that whenever I put a hook in the water, I usually end up reeling in a dime piece mermaid. Unfortunately, you can’t keep mermaids so they are on the catch, slay and release program. Fish and Wildlife are very strict with mermaids. What happens when a 200 pound tuna jumps in the boat and starts flopping around like Trumps hair in the wind and blood is all over the place? Grab the SALT OR FRESH water washdown hose and rinse it off like it never even happen. Wow, that was easy. . .
Crap! I’m the only dude on the boat and none of these chics know how to drop an anchor. . . Boom, press the button to the electric windlass and the anchor falls majestically into the water as if it were an Olympic Diver. Doesn’t even make a splash..
Cooler Seat? Definitely. I’ve needed as much seating for the ladies as possible. So, right now there is a TODD cooler seat in the back of the boat. When I go fishing, I usually have one of the females go remove the seat. It usually takes them about 5 minutes. I wish it took a little bit longer so I could have a break every now and again, but it was designed too well. . .
Oh no! I’ve been drinking all day and I’m way too drunk to drive this fine vessel home!!! Not to worry. Turn on the touchscreen Garmin ECHOmap 70DV Navigation and Fish Finder and tell the most sober chic on the boat to follow the cookie trails home. It’s like having auto-pilot but with voluptuous breasts. . . But what happens if it’s dark out, your auto-pilot is going way too fast and your favorite hat flies off? Turn on the Spotlight, control it with the joystick and tell one of the chics to jump in and grab it. Everyone knows that chics like to always sit on one side of the boat.. When are they gonna get the picture?!? It’s not cool to be driving down the intracoastal looking like your boat just stroked out. Well on this Dusky 233, just hit the hydraulic trim tabs and the boat quickly levels itself out. bang. It also comes with an Aluminum MagicTrail trailer, so that when you aren’t showing off on the water, you can be showing off in your driveway, making every other male in your neighborhood instantly turn Beta. Press on the brakes and the brand new LED trailer lights light up like a Pink Floyd concert. I almost forgot to tell you about that giant, torquey hunk of technology hanging off the back. It’s a 2006 Four Stroke Suzuki DF225. This motor has never left me hanging and I can honestly say it has never even given me an issue. The only thing overheating on this Dusky are the women. . . The motor is a 2006 with 1300 hours but the motor was completely gone through and overhauled in July of 2014. Included was a new factory powerhead that currently has under 200 hours on it. Take the cowling off the motor and it glistens like a Hawaiian Tropic Model. The prop is a new Stainless Suzuki Propeller. 16" diameter and 18.5 inches of pitch. Purchased for $600! All paperwork for the motor will be included with sale. This motor is extremely quiet and powerful. Why am I selling it? Honestly, because it’s already given me many good years, and I just got married and have been advised by my wife that this boat attracts too much tail... So, my loss is your gain. Just be responsible, you future heart-breaker you! Lastly, remember. . . The best two days of boat ownership are the day you buy it, and the day you sell it.... said NO ONE that has ever owned this boat!